amateur radio operators have been dwindling for several years. As a Boy Scout I learned Morse Code and Semiphore Signals but the only Morse Code I remember is for SOS (...---...)! But, if you believe Star Trek, Morse Code will still be used to stage a jail break in the 23rd Century! I never got into amateur radio but I loved regular shortwave broadcasts. Some of my acquaintances knew I was an SWLer but thought that was synonymous with a ham. It was a little difficult to explain the difference. Incidentally, shortwave, as a government form of propaganda is virtually dead. Voice of America, BBC, and a few smaller outlets are about all that is left. It may seem as though there are fewer hams, but in reality, we're growing! With the dwindling interest in Amateur Radio...what will that do to MARS (Military Auxiliary Radio System)? I remember my dad's radio shack. He had an early 2 meter radio, HF tranceivers, a teletype to receive transmitted ASCII art over the airwaves, oh. I also remember he had a Morse code key as well. 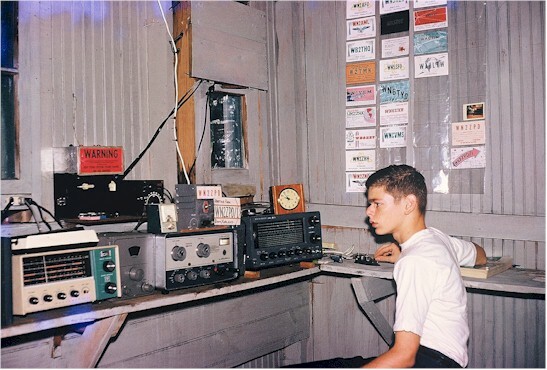 I never followed in his footsteps, but he gave me his Hallicrafters SX-88 communications receiver and had a blast getting programming from foriegn broadcasts, listening to HF QSO's going on around the world and such. I had it plugged into my dad's antenna, and, brother, I was pulling in all kinds of signals from everywhere. 1968 - listened every night to Radio Prague's English language broadcast on a Heath Mohican receiver. One night I got distracted doing other things, and missed the Soviet invasion of Czechoslovakia, including the takeover of all media. History, and I missed it. We had a Ham Club in high school in the late 60s. I still hear from the instructor from time to time. Learned code, but didn't take the test til much later, about 78 if I remember. Took it at the FCC office in Chicago. Like the above post, I, too, didn't go for Novice, instead getting the technician. Didn't think I'd like HF. Turns out I did, though. I won first place in Indiana for Technician Class in the Novice Roundup in 81, and TRIPLED my code speed! That same week I test for General, and have been happy with that ever since. I still remember my trek down to the FCC office at 701 varick street in New York to take my test in 1977. I only took the technician, and have never upgraded. I was more interested in VHF than HF anyway. I later returned there to take my 1st class radiotelephone license exam. My most fun in ham radio was competing in the June and September VHF contests as part of the W2SZ multioperator team on the summit of Mt. Greylock in western Massachusetts.